The heart is said to be an essential organ because the body cannot function without it. The heart is a muscle whose function is to pump blood by rythmic contractions so that the blood circulates throughout the body. It constantly circulates 4 to 5 litres of blood from birth to death. Each day the heart has to beat on average 100,000 times and pump 8,000 litres of blood, i.e., 2 thousand million beats on average over a life. The blood is the means for nutrients, oxygen and many other molecules (or cells) to be carried throughout the body to supply the cells, ensuring that the brain, muscles and all other organs function correctly. Even the heart is vascularised. The heart rate can also adapt to the body's needs. When the body is resting, the heart beats 60 to 100 times per minute (the heart rate is faster in children than in adults, and a woman's heart beats more quickly than a man's heart). If the body is active or emotional, the heart accelerates by nerve stimulation or in response to hormones (adrenalin). The heart is located in the left two-thirds of the chest cavity and measures approximately fifteen centimetres. It weighs 300 to 350 grams. It is said to be approximately 1.5 times larger than a closed fist. The heart is composed of two independent halves called the left heart and the right heart, each of which is made up of an atrium and a ventricle. The right atrium receives oxygen-depleted venous blood after it has passed through the body from three veins: the superior vena cava, the inferior vena cava and the coronary sinus. Blood is then passed into the right ventricle, which is then responsible for pumping it into the pulmonary artery and to the lungs, where it is reoxygenated. The newly oxygenated blood then arrives in the left heart from the lungs through the pulmonary vein. 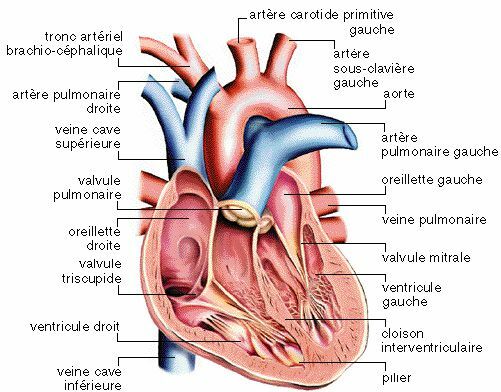 The blood arrives in the atrium again and leaves to go to the aorta by contraction of the left ventricle to the aorta, which sends the blood to the arteries. The left side of the heart contains three times more muscle than the right heart, as it has to pump blood throughout the body, from the head to feet. the inner layer is the endocardium, which is also composed of of epithelial cells and connective tissue, but is thinner than the pericardium.